If you precooked the rice and boiled the corn earlier. 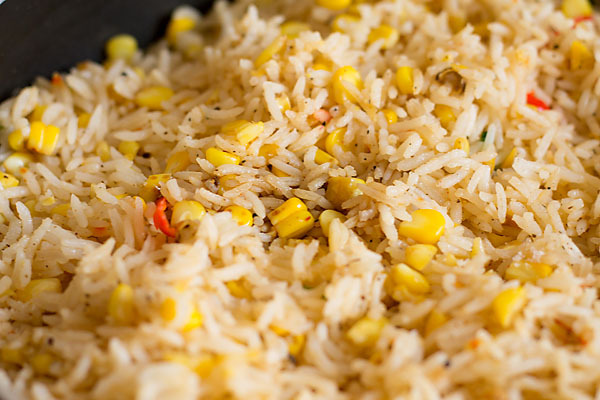 Then it would take just about 3-4 min’s to make this fried rice. Since sweet corn is the hero I haven’t used any other veggies but you cold use mushroom, capsicum, carrot, french bean etc to make them healthy. I usually make a different kind of rice recipes home as we both love rice. So any good recipe is always welcomed and relished. We ate our sweet corn rice with chilly potatoes along with some Szechuan sauce. 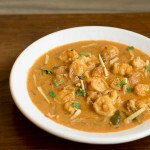 You could even club with Manchurian or some oriental gravy based dish. 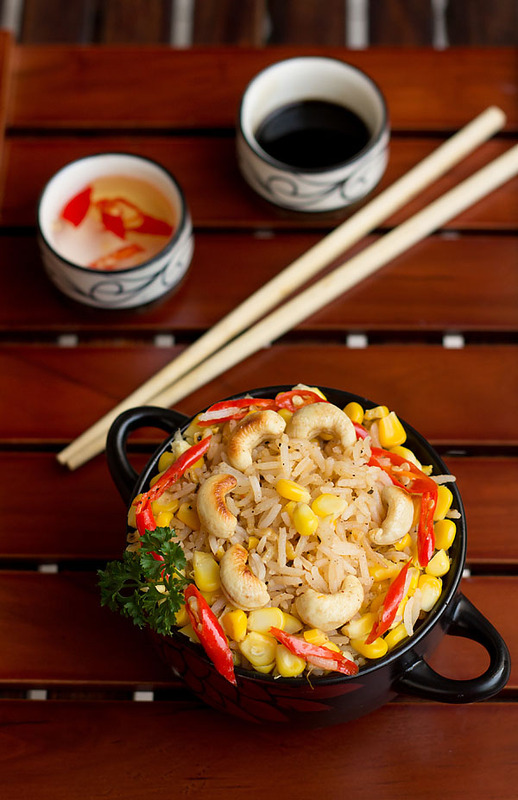 To give an authentic Chinese touch have used Sichuan pepper powder along some black pepper powder. If you don’t have Sichuan pepper just skip them. 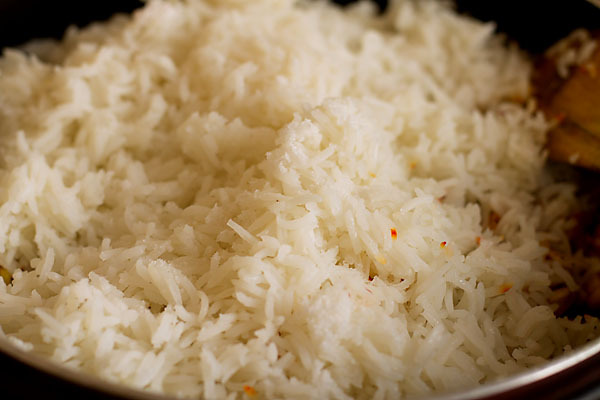 However, they do impart a great flavor and aroma to your rice. 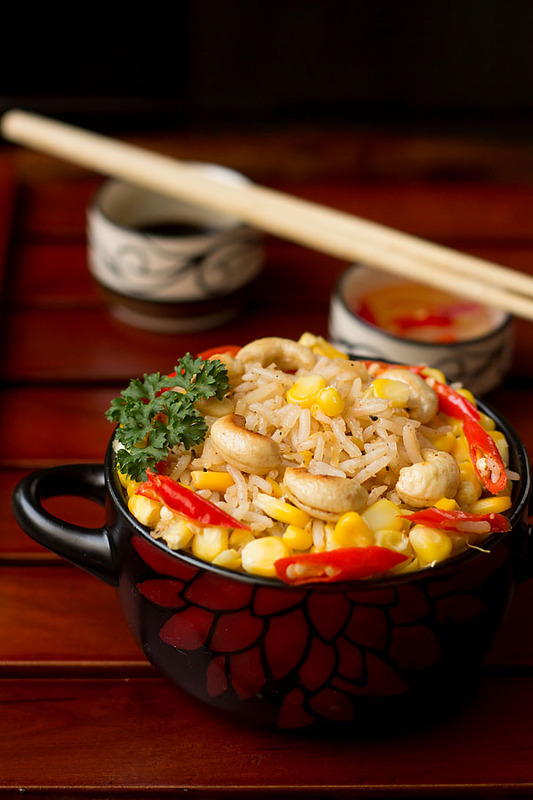 Sweet corn gives a sweet flavor whereas the chilies and sauce give a nice hot and tangy flavor. If sweet corn isn’t available use the regular corn. 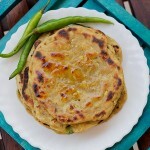 But the taste would be different so preferably use sweet corn or canned sweet corn. Have added some fried cashews but that’s optional. 1. Firstly boil rice or pressure cook rice until 3 whistles. Strain them on a colander and allow to cool. I have used saffron strands but they are optional. 2. 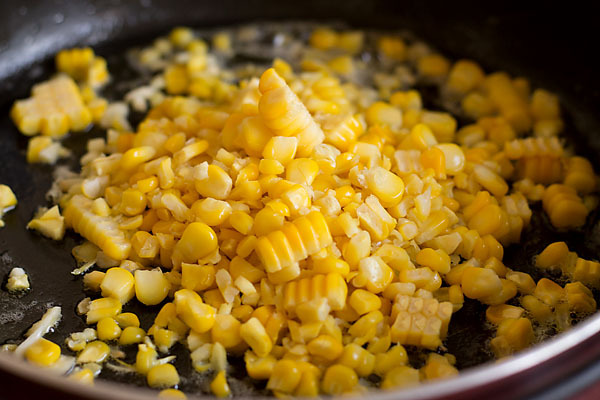 Similarly, boil or steam corn until they are soft and tender. 3. 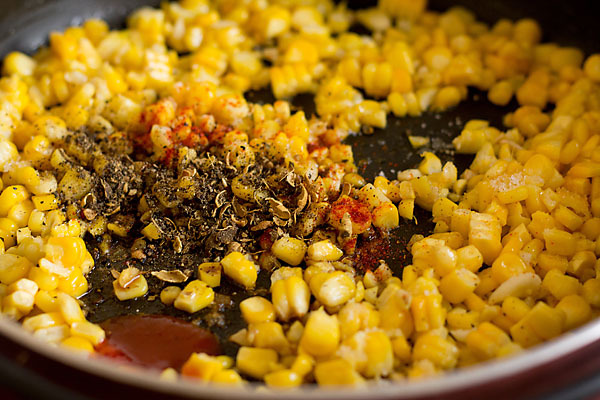 I make my secret Chinese spice by taking equal part of Sichuan pepper (teppal or trifal) and pepper corn. Roast them for a minute. 4. 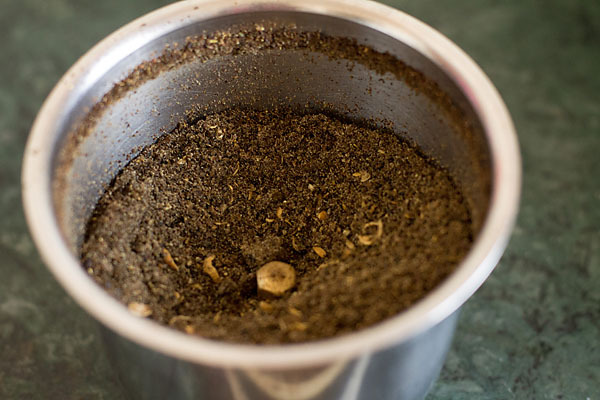 Then dry grind them until a coarse powder is formed. Now use only 1 tbsp of this grounded powder and reserve the rest for future use. 5. 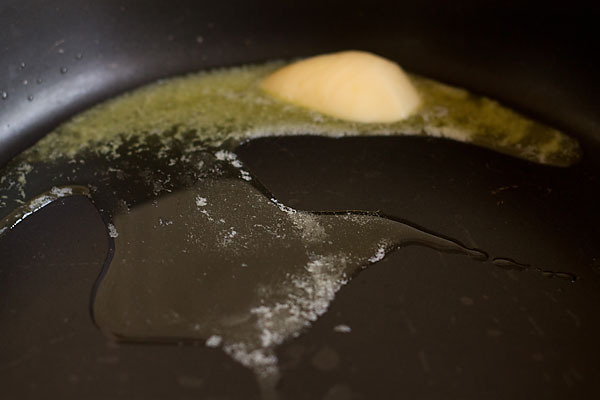 Heat a nonstick pan add oil or butter. 6. Saute chopped garlic and ginger until they change their color. 7. Time to add the boiled sweet corn. Mix nicely. 8. Now add Sichuan pepper, black pepper, and red chili powder. 9. Toss the rice gently ensuring everything combines nicely. 10. Finally, add salt and chilies. 11. Stir fry on high heat for 2 mins then switch off the gas. 12. 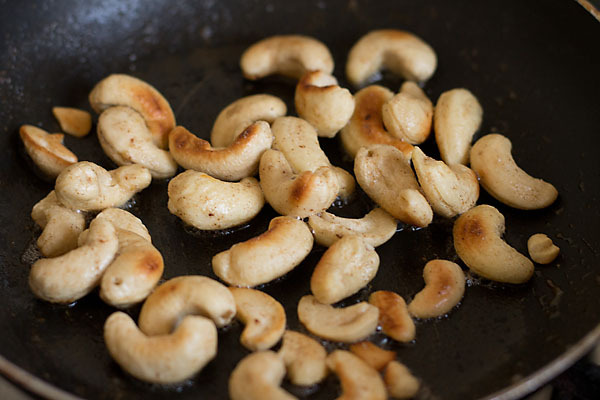 Keep your shallow fried cashew ready. 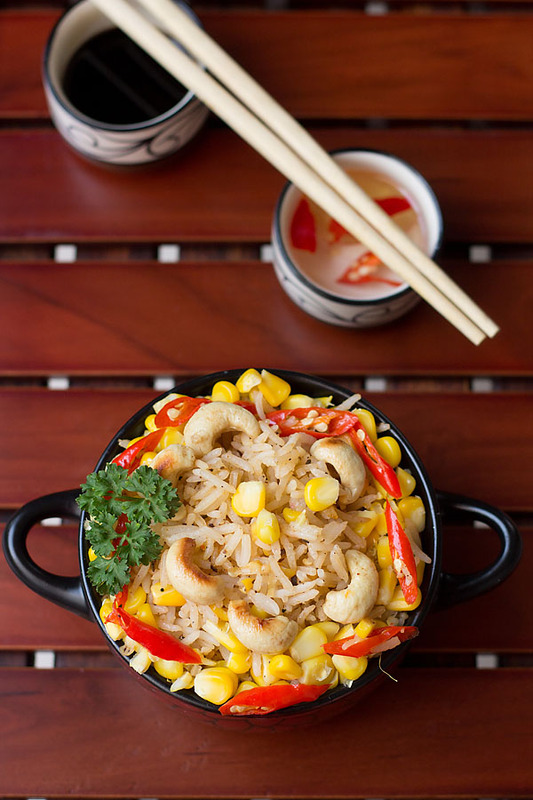 Serve your corn fried rice hot with fried cashews and sliced chilies. Club some side dish like Manchurian or oyster sauce. 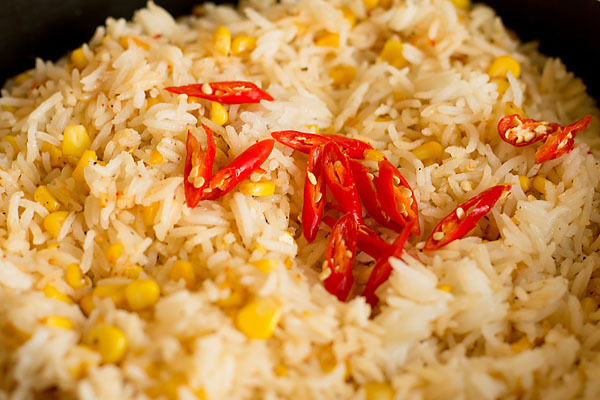 Sweet Corn Fried Rice Recipe made quickly and with basic ingredient's. How to make the recipe? 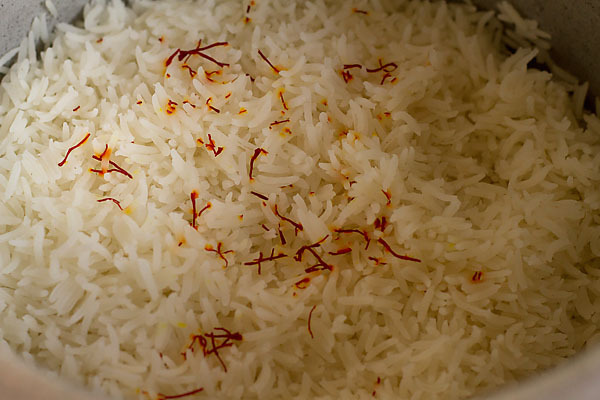 Firstly boil rice or pressure cook rice until 3 whistles. Strain them on a colander and allow to cool. I have used saffron strands but they are optional. 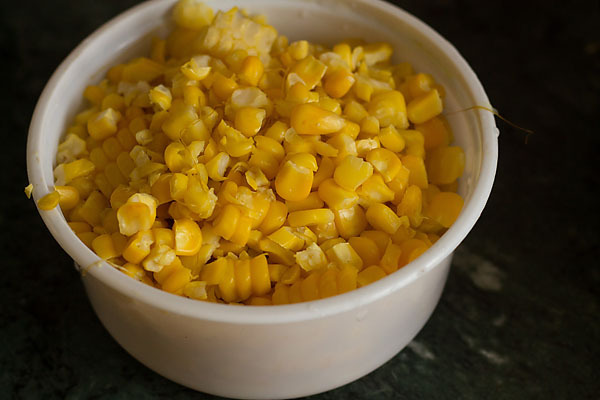 Similarly boil or steam corn until they are soft and tender. 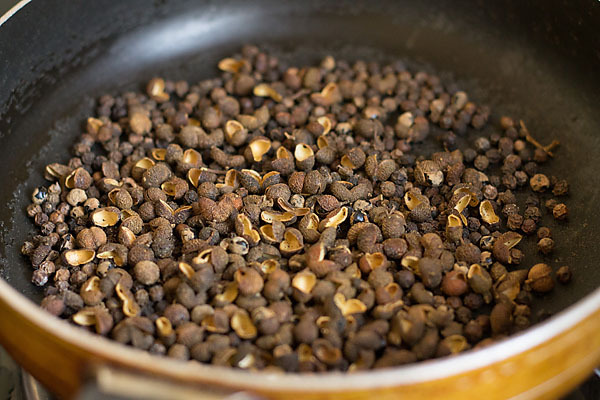 I make my secret Chinese spice by taking equal part of Sichuan pepper (teppal or trifal) and pepper corn. Roast them for a minute. Then dry grind them until coarse powder is formed. Now use only 1 tbsp of this grounded powder and reserve the rest for future use. Heat a non stick pan add oil or butter. 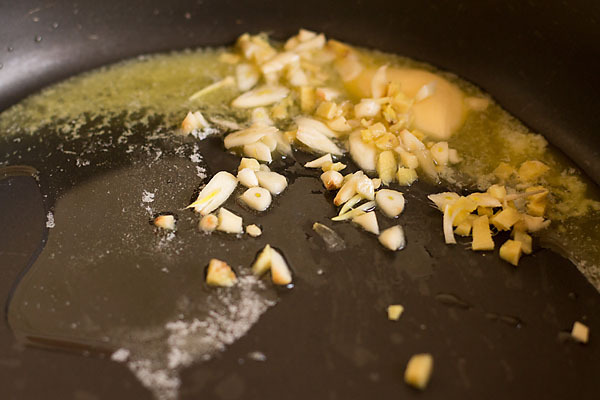 Saute chopped garlic and ginger until they change their color. Time to add the boiled sweet corn. Mix nicely. Now add Sichuan pepper, black pepper and red chili powder. Toss the rice gently ensuring everything combines nicely. Finally add salt and chilies. Stir fry on high heat for 2 mins then switch off the gas. Keep your shallow fried cashew ready. 1. 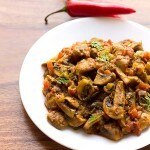 You could use any veggies of your choice like capsicum, mushroom etc. 2. If you don't have Sichuan pepper just add pepper powder then. 3. Adding fried cashews are optional. 4. I don't prefer ajinomoto but you could use them if you wish to. Firstly a big thankyou for trying some recipe and sharing your views 🙂 would surely keep updating new posts. 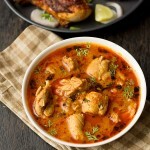 I work at Secretindianrecipe.com – A community of passionate home cooks and Indian food lovers who love to share their recipes online and make new friends. 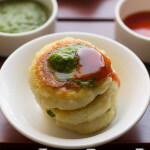 While browsing through a few food sites I glanced upon your blog cookingwithdarshu.com. 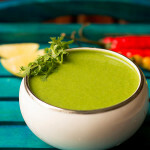 I find your recipes very interesting and easy to follow. At this time we are looking for recipe partners, If you are keen, please contact us or share your contact details.